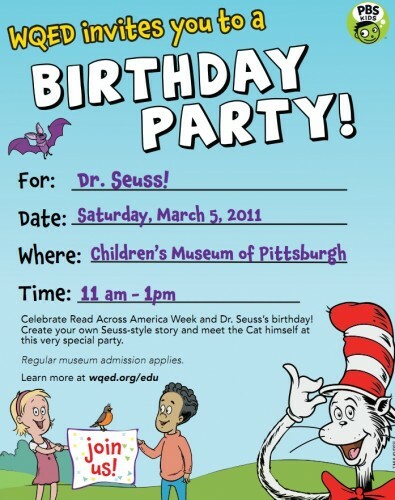 I just got this email from the WQED education email list about a Dr. Seuss birthday party at the Children’s museum this weekend. I love that there always seems to be a birthday party to celebrate in this town – did anyone go to the Toonseum or this case the Tunaseum to celebrate Charlie the Tuna‘s big 5-0 birthday last Saturday? But this got me thinking – does anyone else remember the Dr. Seuss exhibit which was at the Carnegie Museum of art sometime in the 1980s. I have a vague memory of seeing it at the art museum. As a kid I loved and I still love those big steps that lead up to the art galleries. I have tried every google search I can think of to find more about the exhibit. 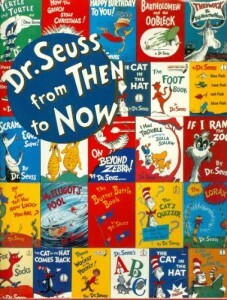 I did find this book – Dr. Seuss from Then to Now: A Catalogue of the Retrospective Exhibition which was published in 1987. And this Dr. Seuss collector mentions that the exhibit was put together by the San Diego Museum of Art and traveled to 7 museums around the country. Used copies of the book can be found on Amazon and I also found one on Etsy here. I think this is the same exhibit – Darcie Forman Museum Exhibits includes a Dr. Seuss exhibit on her projects page here – I don’t think these photos are from the Carnegie Museum. You can read the introduction to Dr. Seuss from Then to Now here (this is provided by the Saper Gallery which hosted a D.r Seuss exhibit in 2008). Which brings us back to this weekend – while I would love to hop into my time machine and travel back to the Carnegie museum in 1986 – the time machine is in the shop for repairs so I will just have to settle for the Dr. Seuss birthday celebration at the Children’s museum this weekend. The birthday party is included with regular musuem admission. There will be story book making and visits from the cat in the hat too. 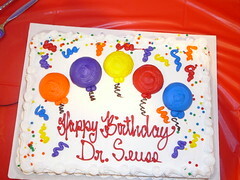 Read about how others are celebrating Dr. Seuss’s birthday….